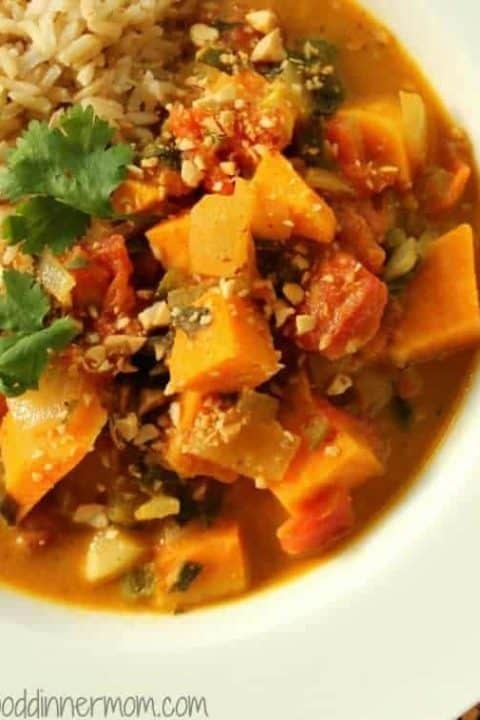 African Peanut Stew is a hearty dish, packed with protein that is super nutritious and so delicious. Using natural peanut butter, tomatoes, yams and collards, this combination sounds a bit strange. But the result of this medley is comforting and spectacular. The yams are chunky but taste creamy while the collards add a subtle bitterness and the tomatoes and jalapenos add just the right freshness to the stew. 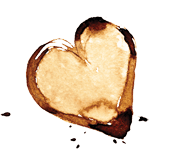 The peanut butter and curry powder blend together for a warm, earthy base. Also, the jalapenos are seeded and diced so the heat is mild but may be increased if you prefer. African Peanut Stew is meant to be served with brown rice. If you prefer, you can also add the meat of one diced chicken breast, in place of one of the yams. 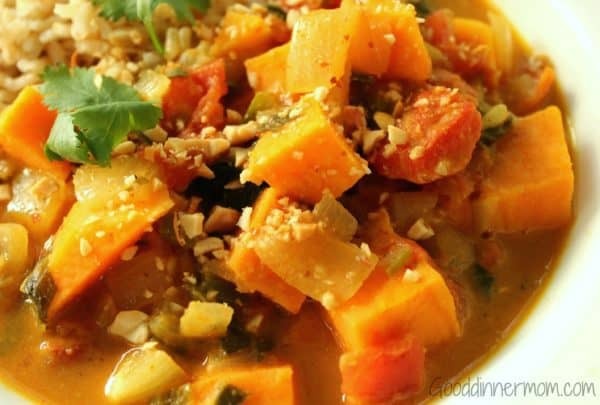 Chock full of nutrients, this stew is true comfort food anytime of year. 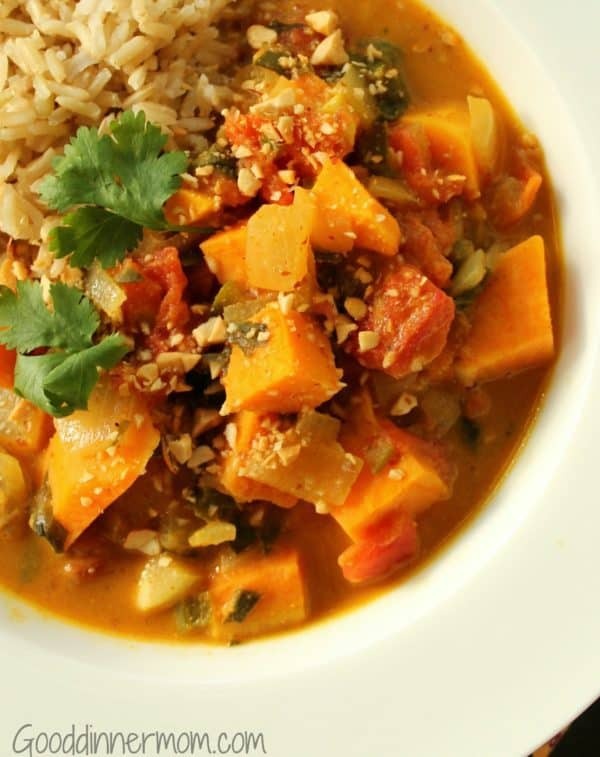 African Peanut Stew is hearty and earthy. A perfect comfort food with complex flavors and texture. Meanwhile, in a 5- to 6-qt saucepan or stockpot, heat oil on medium heat. Add onions and sauté, stirring occasionally, until tender, 5 to 7 minutes. Add garlic, jalapeños, curry powder and ginger and sauté for 1 more minute. Stir in the broth, tomatoes and peanut butter. Add potatoes and chard and increase heat to medium-high. Bring to a boil, then reduce heat to a simmer and cook until potatoes and chard are tender, uncovered, 12 to 14 minutes. Season with salt. Recipe adapted from Clean Eating Magazine. Just curious about the tomatoes…it calls for boxed or jarred….is that similar to canned? How many cans would it take, if I used canned diced tomatoes? Hi Amy, yes you can definitely use canned diced tomatoes. You could use one 15 oz. can of tomatoes. I love how healthy this looks! I’ve been trying to incorporate more vegan foods in my diet and this fits the bill!